Wheeler, Maggie . "The Lost Villages". The Canadian Encyclopedia, 01 October 2015, Historica Canada. 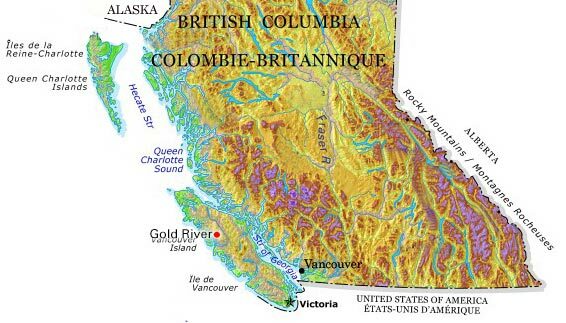 https://www.thecanadianencyclopedia.ca/en/article/the-lost-villages. Accessed 21 April 2019. The Lost Villages are nine Canadian communities that were destroyed through the unprecedented land expropriation and construction of the St. Lawrence Seaway and Power Project in the 1950s. The Dawson Family farmhouse in the Lost Village of Dickinson's Landing awaits transport atop one of the Hartshorne House Moving Company machines. Purchased in 1955 by Ontario Hydro, the house was the first to arrive in the new town of Ingleside and was used as a stopover home for the duration of the project. The Lost Villages are nine Canadian communities that were destroyed through the unprecedented land expropriation and construction of the St. Lawrence Seaway and Power Project in the 1950s. Formerly located on the north shore of the St. Lawrence River between the city of Cornwall, Ontario, and the village of Morrisburg, Ontario, the Lost Villages include the villages of Milles Roches, Moulinette, Dickinson’s Landing, Wales, Farran’s Point and Aultsville; and the hamlets of Woodlands, Santa Cruz and Maple Grove. The sites of these communities now lie under the waters of Lake St. Lawrence. The communities of the Lost Villages were established by United Empire Loyalists in 1784 after the American War of Independence, and were still populated primarily by their descendants at the time of the Seaway’s construction. Many of these Loyalists were disbanded soldiers from the King’s Royal Regiment of New York, or the “Royal Yorkers.” Captain Jeremiah French received one of the first land grants from King George III — lot 22 and part of lot 23 — in what would become the hamlet of Maple Grove. 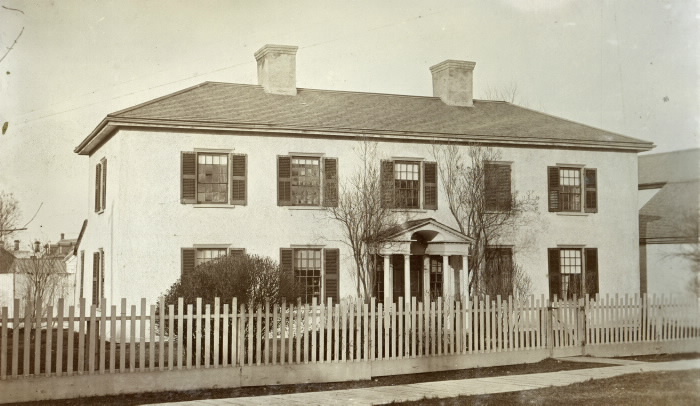 During the expropriation, the French-Robertson house was one of the buildings relocated to Upper Canada Village Museum, where it stands today. The surrounding townships of Osnabruck and Williamsburg were settled primarily by German Lutherans; the township of Matilda by a mix of mostly German and English settlers. The creation of the new Canadian shoreline was a substantial part of the Seaway Project and a source of international interest as much as the engineering marvel of the Seaway itself. The Canadian rehabilitation project was managed by Ontario Hydro (now several corporations, including Ontario Power Generation and Hydro One). The village of Iroquois was moved in its entirety 1.6 km north of its original location to make way for the construction of the Iroquois Control Dam. The village of Morrisburg lost its original main street and business district. Although Morrisburg and Iroquois were affected by the project, these villages remain in altered forms with their original names and are not considered part of the Lost Villages. Two new communities were created above the flood zone to house the residents of the Lost Villages. New Town Number 1 (now the village of Ingleside) became the new home of the residents from Aultsville, Farran’s Point, Wales, Dickinson’s Landing, Woodlands and Santa Cruz. Residents from Mille Roches, Maple Grove and Moulinette moved to New Town Number Two (now the village of Long Sault). Railway lines and highways also had to be moved out of the flood zone. Sixty-four km of the historic Grand Trunk Railway of Canada (now Canadian National Railway) were removed and rebuilt to the north. Highway 2, that had been the main auto route between Toronto and Montréal, and linked the Lost Villages along the river, had 56 km also rebuilt to the north. Unlike the railway, which was removed, the “Old Two” highway was simply flooded over and remains visible under the waters to this day. In total, 6,500 people and over 500 buildings were moved in the Canadian rehabilitation. An additional issue was what to do with the 18 small cemeteries that dotted the Old Front’s landscape. Only one was moved in its entirety, the Maple Grove Cemetery that now resides on County Road 2 (previously Highway 2) on the western edge of Cornwall. This cemetery had to be moved as it stood in the way of the construction of the Moses-Saunders Power Dam. With the other cemeteries, the graves were moved only on demand or if they were quite recent. In all, 2,560 monuments were moved. The graves left behind were covered with limestone or large stone slabs to prevent water erosion. A massive engineering project, the science of moving homes captured the public’s imagination as houses and communities became mobile along the Old Front for three of the St. Lawrence Seaway’s four years of construction. At the onset of the project in 1954, Ontario Hydro offered two options to affected residents: they could choose from replacement homes, or could receive market value of their homes plus 10 per cent. Replacement houses would be built in the planned communities to replace all those in the flood zone, which were set for demolition; however, residents were unhappy with the “chicken coop” houses offered by Hydro. They also objected to the cash offer, as land in the planned flood zone had been devalued for years due to the coming of the Seaway. Market value was therefore not enough to replace homes — building a new house would mean a mortgage and new financial stresses for those living in mortgage-free generational homes and farms. By late 1954, Ontario Hydro explored the option of residents moving their homes to the new communities, receiving lots on which to put them as part of their compensation. This option effectively dealt with the local demand for replacement value of properties. The contract for this massive undertaking was given to the Hartshorne House Moving Company from Moorestown, New Jersey. William (James) and Clarence Hartshorne had just completed house moves for the New Jersey Turnpike at the time of the Seaway’s construction. They brought with them their moving team plus two massive house moving machines that were shipped by rail and assembled upon delivery in Iroquois. Moving a house required the separation of the house itself from its foundation, the severing of any power and phone lines, and transport to a new cinderblock foundation built to match the house in the new towns. Additional work had to be done by Ontario Hydro to successfully move the homes. The Lost Villages were not on waterlines and most houses still had woodstoves for heating. Homes to be moved required the installation of indoor plumbing; some also required installation of ductwork for new furnaces. A move usually took one day, and eventually one day’s notice was all that was given. 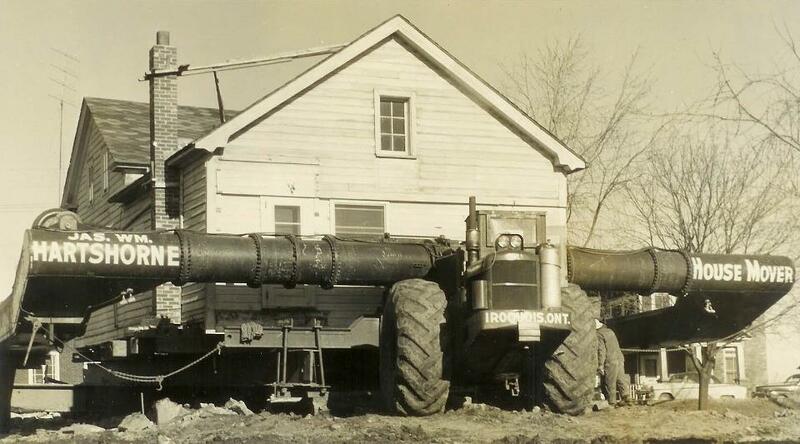 Still, these state-of-the-art house moving machines did not require the houses to be emptied for moving. In fact, residents were told only to place table lamps on the floor. House moving began in the spring of 1955 in Iroquois and ended in January 1958, continuing non-stop through the coldest days of the winter seasons. Ontario Hydro had chosen Dominion Day, 1 July 1958 (now Canada Day), as the date for the completion of the head pond. The last cofferdam was set for demolition at 8:00 a.m., and the public was promised a great wall of water that would come rushing out over the land. An estimated 70,000 people turned out on both sides of the river for the spectacle that morning. Traffic was halted on the new Highway No. 2 and residents of cottages in the area were evacuated. The blast came at 8:01 a.m. Twenty-seven metric tonnes of explosives breached Cofferdam A-1, starting the flood of over 160 km2 of prime farmland behind the new powerhouse. No wall of water appeared for the spectators. In fact, nothing appeared for almost an hour. The blast was an “unspectacular whisper”and the flooding took four days. Residents of the former villages marked it in several ways: some followed the flooding by car; some returned each day to mark the advancing water level; some waited by their former home sites until the water drove them back; and some stayed home to avoid it completely. Tied as the former villages were to the St. Lawrence Seaway construction, the new villages and their development were part of the post-Seaway fallout. Within weeks of the construction’s completion, most of the temporary workforce left the area along with their artificial boost to the local economy. Where riverfront communities with local tourist facilities once existed now lay the Seaway and riverfront lands owned by Ontario Hydro. The end of the old canal system was also the end of the Old Front’s river-based economy, as the new Seaway hosted an international shipping traffic corridor between Montréal Harbour and the ports on Lake Ontario. With the completion of the Kingston to Lancaster section of Ontario Highway 401 (Macdonald-Cartier Freeway) from 1964 to 1968, the “New 2,” which had replaced the “Old Highway 2” was no longer the main east–west highway for that region. An additional loss of tourist travel and business followed despite the post-Seaway creation of several public parks and Upper Canada Village under the helm of the St. Lawrence Parks Commission. The area never saw the promised economic and consequent population boom predicted by the Seaway planners. Iroquois Village boasted 1,036 residents in 1950; the 2011 census reported a population of 1,139. The experiences of the former villagers during the project highlighted unsatisfactory and outdated laws governing expropriation in Ontario, particularly in terms of the power allowed to Ontario Hydro over the public. A provincial committee was appointed to review the processes of expropriation in Ontario. Subsequently, it recommended that power to take possession of land without formal notice and/or consent of the landholder would be exercised only with the approval of the Ontario Energy Board and after a public hearing. Expropriation laws were then changed in the 1960s to bring all procedures under one act, including guaranteeing property owners would be informed as to the basis of compensation and receive financial help with moving expenses, appraisals and legal fees. By the end of the decade, the federal Expropriation Act —unchanged since 1886 — was also reformed. In the new towns, ties to the Lost Villages persisted. Celebrations marked the 30th, 40th and 50th anniversaries of the Inundation. In 1977, the Lost Villages Historical Society was formed; today, the society hosts the Lost Villages Museum just east of Long Sault. Lost Villages Historical SocietyThe website for the Lost Villages Historical Society. Click on the names of each community for information and images of each community. Lost VillagesAn illustrated history of the “Lost Villages,” a small group of riverbank communities that were submerged as part of the St. Lawrence Seaway project.